Our custom designed UV exterior artificial green walls continue to be in great demand. Our latest installation was recently completed at The Village at Howard Hughes Center, near LAX. 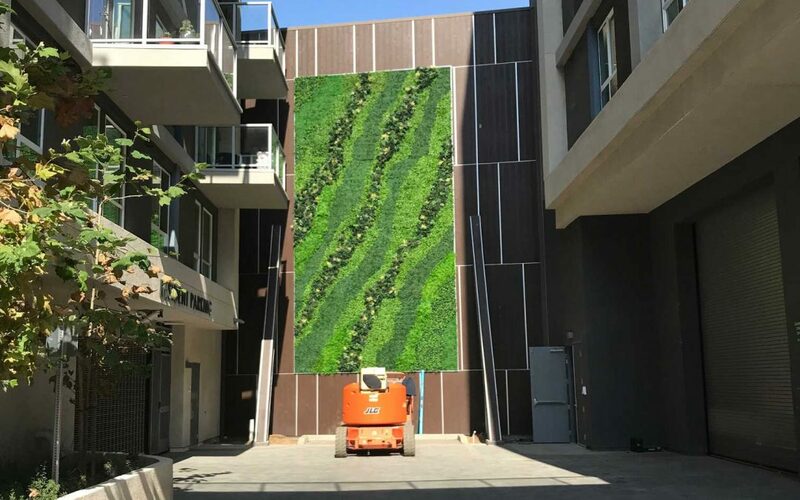 This large scale UV exterior green wall – 30 ft. tall x 16 ft. wide – was designed with a mix of a variety of UV stabilized foliages, creating a natural, fluid design. Our aluminum framing coordinated well with the aluminum decorative trim accent on the existing wall – providing a polished, finished look. The “before” and “after” photos show how our green walls can add beauty and greenery to a stark wall. These custom artificial green walls are constructed on 6″ gridded, powder-coated lightweight metal backing – and can be custom designed per specifications. This simple modular system makes for easy attachment to any type of wall. And, imagine, these exterior green wall plants will remain looking beautiful – with no maintenance! Custom Artificial Green Walls Are Maintenance-Free! Make Be-Leaves, located in Agoura Hills, California, manufactures artificial plants (also known as silk, dried, faux, or fake) flowers and trees. Here is where landscape architects and interior designers are in control of the wild. We are among the top artificial plantscaping companies in the country. We supply an endless variety of bespoke faux plants, silk flowers, and trees. Crafting contemporary artificial plants using a combination of silks, UV treated fabric, and wood materials. These are commercially rated, maintenance-free UV stabilized artificial plants for indoor and outdoor living spaces. Make Be-Leaves is proud to be a GSA-approved, WBENC-certified Woman Owned business.